OK. Let me start by saying that I love my glider. LOVE IT. It takes up half the nursery but it’s my favorite spot in the house. I nurse in it, I rock in it, I sleep in it. 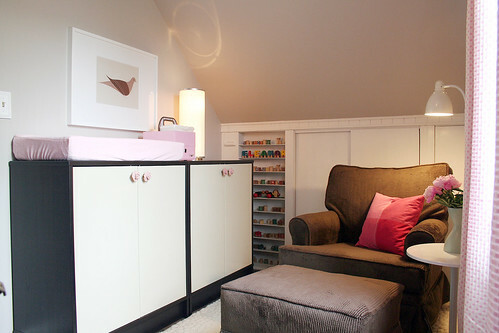 Our changing table is just a changing pad set atop bookshelves with doors. The pink flower knobs help the unit look like it belongs in a little girl’s nursery instead of an office space (which is what it’s meant for). Also, I’m glad my mom recommended getting a lamp with a dimmer. I can have just enough light to change and nurse Eleanor when she wakes in the middle of the night, but I can keep it dark enough to signal that it is still nighttime (and that she should be sleeping!). Behind the bookshelves you can see the closet and its little built-in shelves. Quite a while back, I had decided to fill those shelves with wooden blocks and spools. I’ve also added a vintage pull-toy that I picked up at a garage sale and a name train that we received as a gift. We’ll have to remove some of these toys once we really start baby-proofing, but for now they all look cute. Both Brandon and I slept in Jenny Lind cribs when we were babies, and now our daughter does too. I bought the mobile that’s hanging above the cribthe mobile that’s hanging above the crib a few months ago with the intention of altering it slightly because it was far too big. It’s now much better suited to the small scale of our nursery. We have some paper suitcases from my shop on top of the dresser that we painted pink. There’s also a big metal ‘E’ and a pink vase from a garage sale, along with Brandon’s childhood stuffed bear. He loved that bear so much he hugged the stuffing out of the middle! It’s incredibly sweet, and we hope Eleanor will love it as much as he did. The little sunken alcove next to the dresser will be a play space for Eleanor once she’s old enough. I wrote a little more about that back in January. I’ve listed all of the nursery resources in a previous post, so take a look if you’re wondering where something in the room came from. Thanks for letting me share Eleanor’s nursery with you! So pretty! Perfect for a baby girl! This is beautiful :) congrats! Absolutely gorgeous…what a happy, soothing, restorative room for all of you. So many elements of the room can be repurposed when she gets older. You should be proud! that crib and bedding is DELICIOUS! i love how you didn’t go crazy with a theme, just made it a beautiful room with your typical great design. love it! Beautiful. You’re a lovely inspiration. What a peaceful and pretty space. Thank you for sharing! this is just lovely. what a sweet and gentle room you’ve made for you little girl, i’m sure she must love it. It’s totally worth the wait :) Soothing, girly and sophisticated. You did a beautiful job! It’s beautiful but I wouldn’t expect anything less from you. This is such a peaceful place. I love it so much! Eleanor has a great space. A great glider is key. I can’t tell you how many hours I’ve spent in mine. Beautiful room! 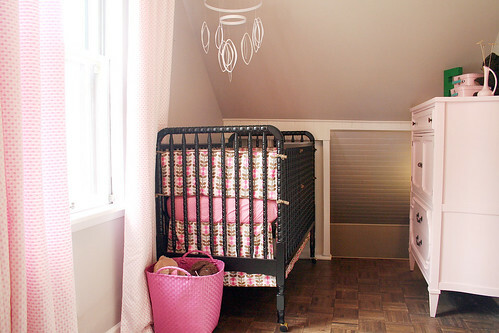 What a lovely little room for a sweet little girl. 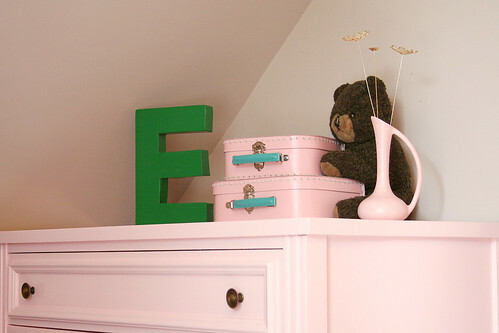 I love how your dresser matches the pink accessories on top! I’ve been voting for you every day on the BHG website. Glad to see you’re back in first place! Gorgeous! I especially love that you altered that awesome Ikea mobile- and the vintage toys (and Brandon’s bear) are so sweet. Is that an Ikea’s Lersta floor lamp next to the glider? Have you painted it white? Such a sweet space! Thanks for sharing. I would hate to see your spools and blocks disappear in the baby-proofing. Is there perhaps a way you guys can install a glass door that locks over that area so the items can stay, while still being safe for little Eleanor as she begins to roam around? It IS lovely! I hope those nursing sessions in the glider have gotten easier for you. I love everything about the nursery! 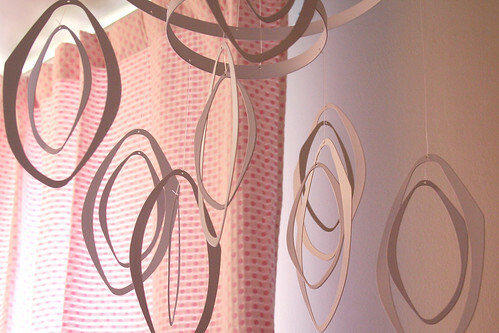 It’s pretty without being too cutesy, and I love its light, airy feel. Eleanor’s one lucky little girl :) Well done! Everything looks perfectly girly. :) Love what you did w/ the space! Such a warming and peaceful room. I also adore your Eleanor in the picture below with the BEST t-shirt I’ve seen in a while. You’re so smart to have a comfy glider and a place to prop up your feet in the nursery. The Orleans rug looks like a soft billowy cloud. Eleanor will love her sweet little room! Love it all. 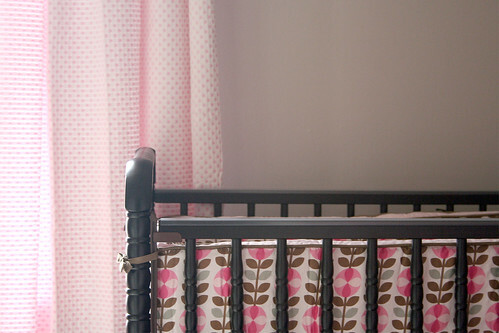 I really like the crib bedding and the paint color. Absolutely amazing. Everything is so sweet, fit for a little princess. 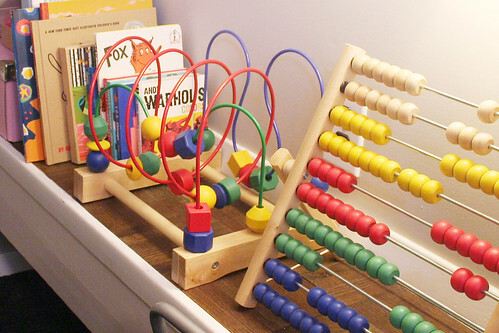 I’m sure Eleanor will be grateful when she gets older to have had the most fabulous and modern pink nursery ever. Congrats, it looks adorable. Beautiful! Perfectly designed in your signature style. I love it! It’s calm and pretty. Really ideal! What a lucky, lucky little girl. It’s really beautiful. Stunning! It looks so soothing. Thanks for sharing! I love it! So peaceful and you probably love it just like i love my nursery. i go in there and am totally relaxed! Oh Nicole I just love her nursery. You did really good. I absolutely love the rocker. Great job!! 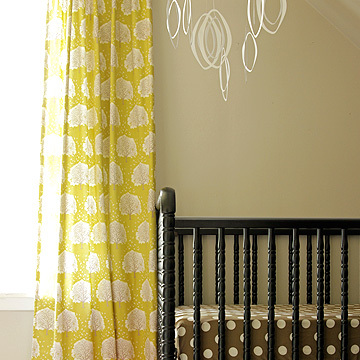 I love, LOVE this nursery. Great job! What a beautiful and serene nursery! I love it all!! Incredibly sweet. Certainly a lovely place for a little girl to grow, learn and dream. adorable! i bet eleanor is one happy baby! hopefully she’ll start sleeping for you! I actually like that the room is such a small space. It’s really just a quiet sanctuary. And the chair, oh the chair….heaven! Very inspirational! Just love it! Oh and I agree with Katie – I love that the room is small. Simply lovely! I am glad to see that an overstuffed glider can look so amazing in such a delicate room! I have to wonder what you’ll do when Miss Eleanor gets older. The room seems very small, will it fit a bigger bed? What size was the daybed you used to have in there? how beautiful! and that little alcove for playing in later is great. I had a space like that when i was little. It was this weird space in my closet that was about 3 feet up from the floor of the closet, because it was on top on another closet downstairs. And i spent as much time as i possibly good up there. it too was hot and stuffy but i didn’t care because it was just mine and no one else was allowed in there unless i said so. It was the best place in the world. Elanor will be so lucky to have a little place like that all to herself! Pink done right! Go to sleep, baby Eleanor! What about that standing lamp behind the Target trumpet table? Where’d you find that? It’s so functionally cute. I just love how you decorate! You have a gift! Congrats on such a beautiful baby girl! So nice! I love that you went with the black crib. The room looks great! That’s a glider?! WOW I want one, and my kid is 2! Gorgeous…as expected from you. Thanks for the eye candy and inspiration! This is a lovely, calm room. And I can’t get over how perfect the dark colored crib looks in the space. Its just beautiful. You did an amazing job in there! what a great use of space. it’s an adorable nursery. Let’s keep “Rocking” the Vote for Nicole’s lovely porch today (Wednesday), Thursday & Friday while she rocks Eleanor in that fabulous glider! What a precious room for a precious girl. I absolutely love your style. Can you tell me where the white floor lamp is from. I checked your previous post listing all of the resources but the floor lamp was not there. Thanks and congrats on a job well done! Ah, I forgot to include the floor lamp. It’s the LERSTA from IKEA. I bought it a couple of years ago… it used to come in white. This is one of the cutest nursery’s I’ve ever seen! It’s pink without being to girly-girl – much like the rest of your house. Love the black Jenny Lind – white would have been too precious. i love it! love all your little touches. 2 things. where is that rug from? i really like it, and the little table the flowers are on? love that too!! duh! sorry went to previous post to find out where you got things! What a darling room for a beautiful baby! her room turned out so sweet. i hope that you two are enjoying all your time together in it. Very lovely and perfectly fitting for a baby girl. Well done! The room is gorgeous! We are expecting #2 and our 3rd bedroom it little, but you did a great job on utilizing the space! Gives me hope! Wow! Your nursery is picture perfect! You were definitely meant to have a girl! :) Where did you find the flowers that are on the dresser? They look perfect in that garage sale find vase! Again, WOW!!!! What a dream! Oh, what I would do for a such a beautiful nursery! 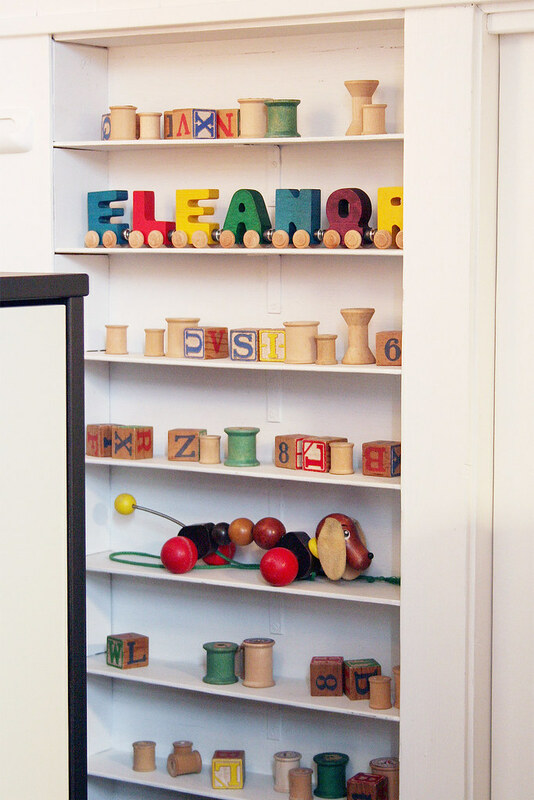 Here’s an idea for the little shelves with the spools and blocks. Cover it all with a piece of plexiglass (unbreakable) temporarily while Eleanor is between 6 months and 3 years. It will be a 3D picture for her to examine and enjoy. Attach the plexiglas in such a way that you can easily remove but securely replace it, and you can change up the display seasonally for Eleanor! Hi,Nicole! Nice to see your blog. I really love your blog theme. Could I know how to apply this kind of theme for my blog. I’m in love with your nursery!! GOOD JOB! I’m going to be trying for a baby after my trip to Europe in 3 weeks and I’m been looking for ideas for the nursery for months. I love your glider and I’ve seen it before on toysrus but unfortunately I live in Canada and they won’t ship to us. We don’t have any nice gliders like you do in the US. :( Hopefully I can find something half as nice here. This nursery is amazing… The space is so wisely used, every single corner has been covered and I love that it can grow with Eleanor… Love it! 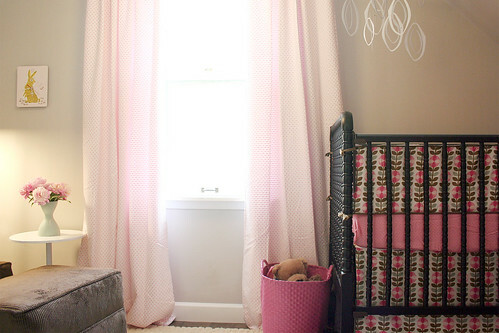 It’s a lovely nursery, I adore the soft colors, so nice for a baby girl without being too sugary sweet. And I know what you mean about your glider, I use my upholstered rocking chair all the time, and end up sleeping a couple of hours in it several nights a week. Ohhh, you’re taking me back to long afternoons of nursing son #1 in our glider, gazing out the window. Beautiful room! I love the sunken play area. Older homes have such great kid spaces! I am surprised the window is so close to the with the hornets and all. I meant to say that I am surprised that the window is so close to the crib with the hornets and all. The window’s OK as long as we don’t OPEN it. With it closed, we just get to watch the scary hornets buzz around behind the glass. Heather, we may go with plexiglass for the little shelves – I figure we have a little time to decide still. love it. its perfect. congrats. I have a four year old Eleanor who would love that room as well! Nicole I came across your blog at ohdeedoh.com. Frankly speaking the color pink attracted my attention to check out your blog and I realized you did a superb job in utilizing multi-purpose furniture in small space. 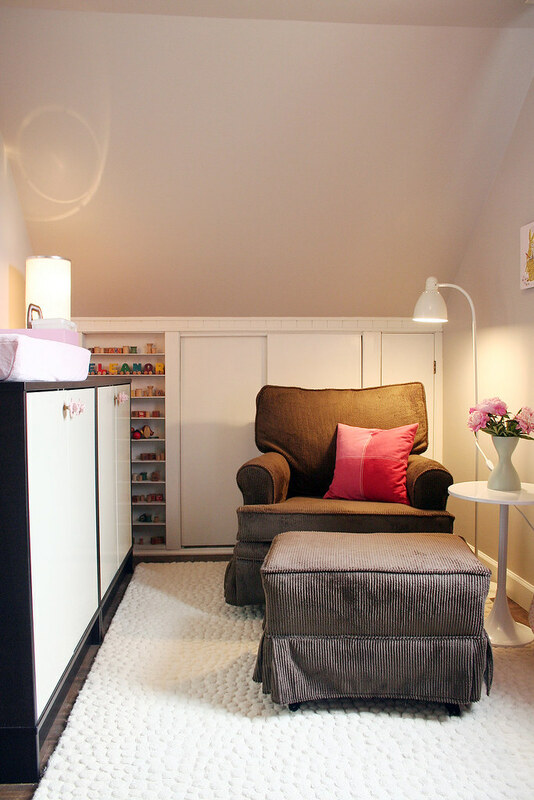 Beautiful nursery for a beautiful baby!